I’ve never written a review before but I just finished reading this brilliant, masterful book on the train home and wanted to share some of the love. 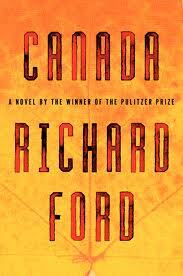 I’m a big fan of Richard Ford but the plot of this novel is probably the strongest he’s written in terms of page-turning. However, if you’re looking for a thriller then you’ve come to the wrong place – as engrossing as the plot is, it’s less important than the writing itself. This was the book that inspired my series of posts about authors who look like their writing: at the time, I called Ford’s style elegant, languid and wise. Sometimes, writing this beautiful can give the illusion of being wise and full of insight – but there’s no illusion here… every page is full of a rich voice that feels as if it may be teaching you something new about the world and the people who live in it. That’s not to say that you need a dictionary to get through the book. It’s that Ford uses language so simply to do such complex things that is his genius and, for me, his only equal in this regard is Cormac McCarthy. Canada is a novel about the strange turns that normal people’s lives can take, it believes in looking forwards and seeing what’s in front of you instead of always looking for hidden meaning in what’s already gone, and it understands above all about human fragility. As you can tell, I would absolutely recommend it. I find it impossible to read a book like this and not be inspired… well, partly inspired and partly accepting that I’ll never be able to write quite that well. This entry was posted in - Authors who look like their writing, - Books, - On writing, - Stuff that inspires me and tagged author, authors, Authors who look like their writing, beautiful writing, book review, books, Canada, cormac mccarthy, fiction, literature, montana, novel, quotes about writing, Richard Ford, story, writing on May 10, 2013 by beautifulorange. Excellent post, certainly looks like a thrilling page-turner. Thanks! Yeah, loved this so much. for a person whose never written a review before you sure did a good job! Thanks John… appreciate that!I guess if you a book enough, you can write about it. I have competition in the book review world it would seem. Nicely done. Ah, well that’s very kind. Thanks. But I don’t think I’ll be making a habit of it… took me a couple of months to read this one! I think my next stop on the Internet is Warerstones. Ha. Good! It’s always tricky recommending books as everyone has such different tastes. But I loved this one.